The yellow bird’s-nest is a saprophytic species of woodland found mainly in County Fermanagh, but with isolated sites in Counties Londonderry and Antrim. Threatened by scrub or woodland clearance. A strange-looking herbaceous plant consisting of a globose, perennial underground stock which bears numerous fibrous roots and seasonal above-ground flowering shoots of waxy appearance. 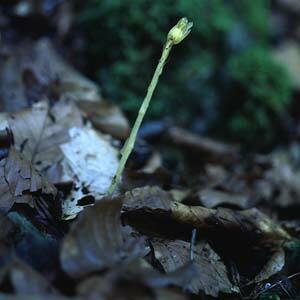 The flowering shoots are totally devoid of functional leaves and of a uniform yellow colour; grows to about 25cm in height. The tubular flowers droop downwards, but become erect in fruit. Flowering shoots may not appear every season. It is probably best described as an indirect parasite of various trees, using mycorrhizal fungi as an intermediate means of connecting to its host. Flowering shoots are somewhat sporadic in their appearance. The plant may persist for an unknown number of years entirely in the form of the curious underground stock which produces numerous roots which are infected by a fungus (called a mycorrhizal fungus). The flowers are pollinated by insects and are succeeded by a round fruit capsule containing the seeds. Many books describe this plant as a saprophyte (feeding on rotting vegetable matter) but it seems probable that it is really an indirect parasite of trees, using the mycorrhizal fungus as an intermediary. This would explain why it always occurs in scrub or woodland. Germination of the seed may take place in the absence of the mycorrhizal fungus, but infection of the seedling by the fungus is required for development to maturity. The species, and perhaps genus, of fungus seem to vary according to the host tree species, but Tricholoma has been identified as one genus with which yellow bird’s-nest is associated in Great Britain. There is no information on which fungi are associated with this plant in Ireland. There are no similar species occurring in Ireland. However, the species is divisible into two subspecies differing in chromosome number and some features of the flower. Most Irish plants seem to belong to M. hypopitys subsp. hypophygea which can be separated from subsp. hypopitys by having flowers which are hairless inside, but the distinctions between these subspecies are not always so clear. The easiest places to find this plant are Straidkilly National Nature Reserve near Glenarm, County Antrim and several sites in western County Fermanagh such as Correl Glen National Nature Reserve near Derrygonnelly, Carrickreagh, Ely Lodge Forest and Castle Caldwell Forest Park around Lower Lough Erne. Look for the plant in woodland or scrub in July or August but remember that it does not always produce flowering shoots every summer at every site. Relevant access permissions should always be sought prior to visiting any sites. The main centre of distribution is in western County Fermanagh, especially around Lough Erne and there is one site in County Antrim, near Glenarm. It was also seen once at Errigal Glen near Garvagh in County Londonderry in 1944. 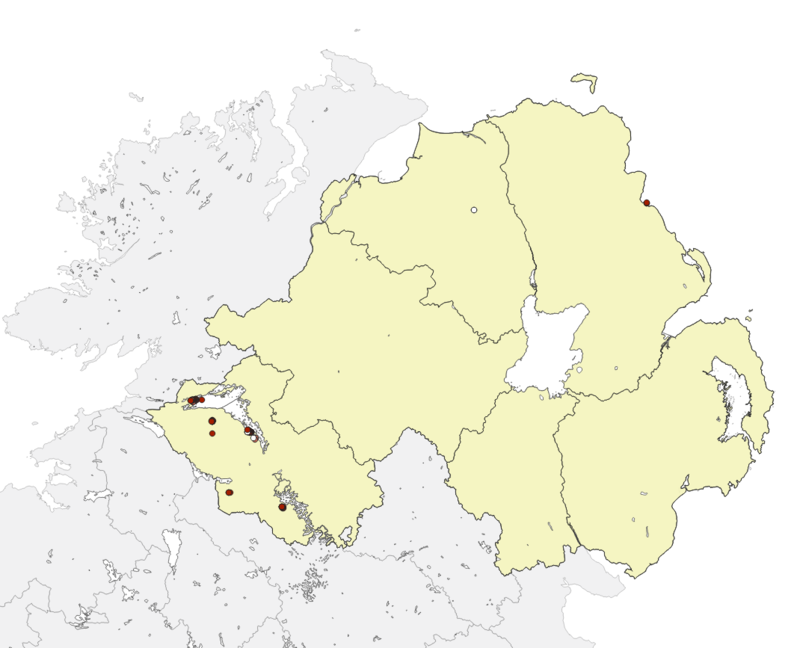 This species is rare with Northern Ireland holding more than 50 per cent of the current known sites in Ireland. It has declined throughout most of the Republic of Ireland and is now known from only 18 per cent of its former total range. It is an Irish Red Data Book species listed as rare. Woodland destruction is likely to be the only serious threat to this species, but an apparent decline could be caused by under-recording – partly the result of this plant’s unpredictable flowering at some of its sites. Sites are monitored on an ad hoc basis by various field botanists. If refound at former known sites, ensure that the population is maintained. This species may be under-recorded. Look for it in areas of woodland, especially on limestone. Send any records to either Botanic Society for the British Isles (BSBI), c/o Botany Department, National Museums Northern Ireland, 153 Bangor Road, Cultra, Co. Down, BT18 0EU or to CEDaR, National Museums Northern Ireland, 153 Bangor Road, Cultra, Co. Down, BT18 0EU, Tel: 028 9039 5256, cedar.info [at] nmni.com.